Aren't they precious?! I saw them at the store a few weeks ago but didn't bother to stop and look... after all, stores almost never have my shoe size, and I didn't want to be disappointed. 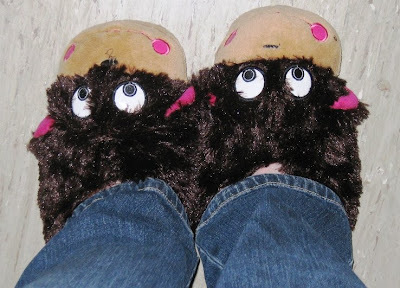 I saw them again this weekend, though, and since I've been looking for slippers for 3 years now (I'm picky!) I decided to risk a peek. And what do you know... there was a pair that fit!